Forward Chaining vs. Backward Chaining: Which is Best? Forward Chaining vs Backward Chaining: Which is Best? You may have heard murmurings about the benefits of forward and backward chaining. These are techniques that are often used by therapists or educators to help students learn tasks. These techniques can be used on any tasks you’re hoping for your child to learn, but are usually used for daily tasks, like tying shoes, brushing teeth, washing hands, etc. For certain kids, chaining can be extremely effective, so it’s worth a try. In this post, I’ll explain what chaining is, how forward and backward chaining are different, and how to incorporate both techniques into your routine. What is Chaining in General? Think about all of the steps we take to complete a task. Let’s use hand washing, for example. See how many steps there were in such a mundane task?! It’s no wonder it takes kids so long to learn how to wash their hands independently. You can also see that the steps in this task link together like a chain. One leads to the next and to the next and to the next until you have a completed task. You can start the chain at the top and work forward or you can start the chain at the bottom and work backwards. And that’s how we get forward and backward chaining. It’s far too much to teach a child all seven steps of hand washing at once. Not only would they get overwhelmed, they would also struggle to remember any of the steps. 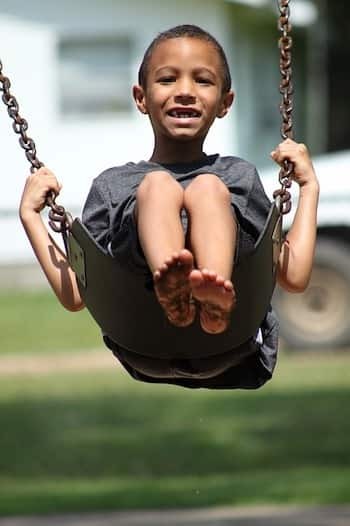 Chaining is a great way to gradually give a child independence in a task, while also ensuring that the task gets completed each time. You can’t simply let your child go without washed hands until they learn how to do it independently. Chaining gives adults a great way to assist children in essential tasks, and children a great way to learn. It’s a win-win! Forward chaining is a little more intuitive, so we’ll start there and talk about backward chaining later. With forward chaining, we want to start by focusing on mastery of the first step of the process. We will then move “forward” to the next steps of the process. Continuing to use the hand washing example, we will first help the child master the skill of turning on the sink. After the sink is on, we will help the child complete the remaining 7 steps necessary for hand washing. After practicing for a while, the child will be prompted to wash their hands and they’ll know how to turn on the sink. Once they’ve demonstrated this mastery, it’s time for step 2. When prompted to wash their hands, the child will turn on the sink and we’ll prompt them to wet their hands. Our goal now is for them to master wetting their hands after they have turned on the faucet. 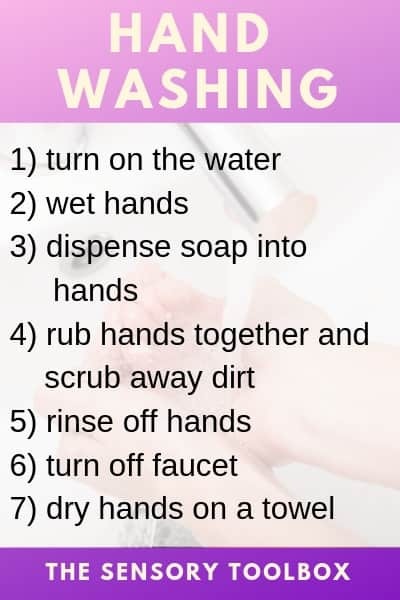 We will then offer assistance for the remaining 7 steps of hand washing. With practice, the child will independently complete both steps 1 and 2 when prompted to wash their hands. Once this happens, it’s time to focus on the 3rd step. When teaching the 3rd step of putting soap on the hands, not only do we focus on the physical skill of pushing the soap dispense, we also focus on the cognitive skill of understanding that this step comes after turning on the faucet and wetting the hands. The child needs to do them in the right order. Continue teaching the child how to wash their hands, step-by-step, until they get to step 7. With each consequent step you teach them, be sure you’re teaching them the physical components, as well as the cognitive components. The more steps they master, the harder the cognitive piece will be. It’s easier to remember the order of two steps than it is seven steps. Given the cognitive complexity that comes with multi-step tasks, expect it to take longer and longer to achieve mastery with each step you add. When the child was at step 2, all they needed to remember was how to complete step 1. By the time they’re at step 7, they not only need to know how to complete step 7, but also how to do steps 1-6 in the correct order. The farther along kids get in a chain, the more likely they are to accidentally rearrange the steps. This will take patience. Your child may be able to complete the steps in the correct order one day but will mix them up the next. If this is happening consistently, it’s a sign that you need to take a step back and decrease the number of steps the child is doing independently until they are more consistently achieving mastery again. Backward chaining is like forward chaining but…backward. Let’s use our hand washing example again. Instead of starting to teach the child independence starting with step 1, we start with step 7. This means that we will give them assistance for steps 1-6. Once we reach step 6, we strive for independent mastery of step 7, drying the hands. After success with step 7, we help the child aim for independent mastery of step 6, turning off the faucet. We continue teaching all of the proceeding steps until the child can do steps 1-7 with full success and independence. Our strategy doesn’t change in that we want to make sure the previous step is mastered before moving on to the next one. The child must be independent in step 6 before learning step 5, for example. 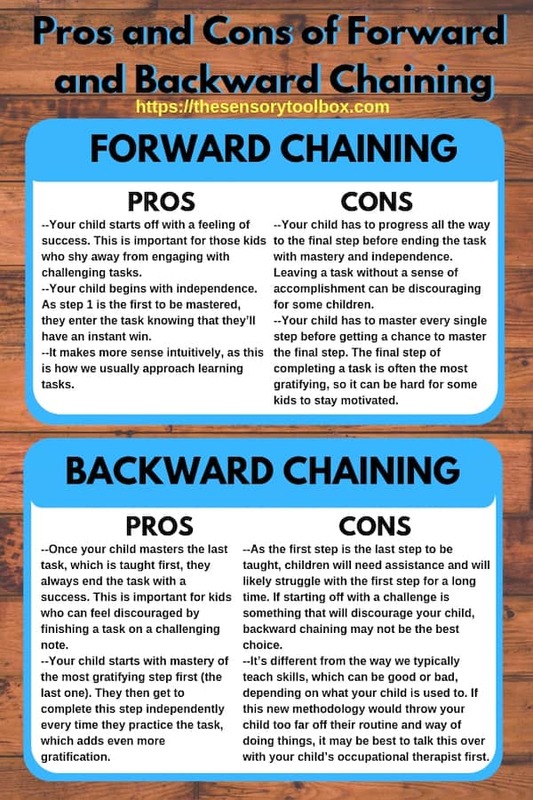 Similar to forward chaining, it’s important that the child is properly remembering the order of the tasks. If you’ve achieved mastery of step 2, but it’s a struggle for the child to independently complete steps 3-7, it’s time to go back a few steps. Forward Chaining vs. Backward Chaining: Which is Better? There isn’t a clear answer to this question. Looking at this study, the method you choose depends largely on the child, if it makes a difference at all. I know this is frustratingly unhelpful so, to make it easier to determine the best fit, I’ve broken down some of the pros and cons of each technique. There’s no absolute right answer when it comes to forward and backward chaining. Instead, there’s a right choice for your child for a certain task. Always talk with your child’s OT or teacher before teaching new tasks with new strategies. Looking for more occupational therapy tips and tricks? Check out my post on handling ideational apraxia.